A Train-Station Swap Meet was hosted by the Roundhouse Gang Model Railroad Club on Saturday, Feb. 25th at the San Bernardino History and Railroad Museum. The Roundhouse Gang, a model railroad club has been around since the 40’s, dedicated to inviting and informing people about the model train hobby. The event allowed people with a “model train” hobby to enjoy with their families. The event creates a connection between the families and the model trains bought at the swap meet. “The event services a couple of purposes. As a club we get some income for it because we sell the table space, what vendors sell to people is their business not our business […]. It is also a chance to promote the hobby in the area and to make it a family event,” said Gary Wintererst, a member of Roundhouse Gang. 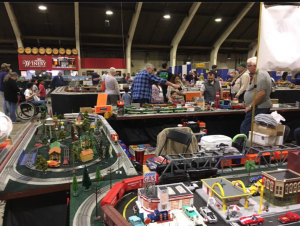 “At these swap meets as a customer and hobbyist I am able to purchase the model trains that interest me while also getting information on how to create other things for my model railroad collection,” said John Bennit, a swap meet vendor. This event has created a platform for vendors and model train hobbyist to network with the community. “We believe that such an exhibit would benefit the local economy and helps the local business by generating more customers,” stated Gary Wintergerst. “The swap meet would also provide an opportunity to convey important historical and railroad safety information that would appeal to a broad age-range audience,” continued Wintergerst. As they continues to bring more swap meets to the Inland Empire, their locations grow larger, and location is a vital part for a model train swap meet. The Roundhouse Gang is also searching for other venues to continue to host the events at. These swap meets are held about three times a year, so plan ahead before attending.